Winter has well and truly set in. This year, I am feeling the effects even more than usual, as in the last 2 weeks I have become one of those crazy (gym) bag ladies waiting at the tram stop at 6.00am to do a morning body pump session. (It is truly amazing what the looming threat of publicly available photos can motivate a person to do!). Despite the frosty mornings, I tend to enjoy the first few weeks of winter, by cooking up big pots of soup, watching copious amounts of trashy TV and curling up to The Brooding Architect on the couch without being reprimanded with his usual summer response of “get off me, it’s too hot to touch”. 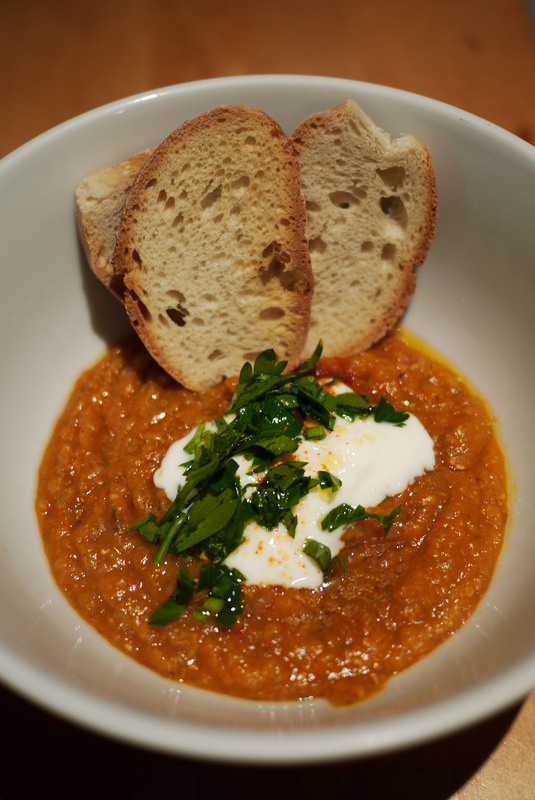 I spent my first winter Sunday cooking up some Spiced Red Lentil Soup. This soup ticks all of the boxes – it is easy to make, healthy and tasty. As an added bonus it also very thrifty – a very important factor given that I am trying to convince The Brooding Architect that ‘thrift is the new black’ in an effort to save for some very frivolous spending on our upcoming trip to France! I like to dress it up with a big dollop of natural yoghurt and some fresh continental parsley just before serving and toast up some thinly sliced sourdough on the side, which serve as a rustic (if somewhat over sized) crouton. If you like things extra hot and spicy, I also recommend sprinkling some extra cayenne pepper on top of the soup just before serving. Heat a large, heavy-based saucepan over medium heat. Add the glug of olive oil and the onion, carrots and celery. Cook for 10 minutes, stirring occasionally until soft and starting to change colour. Add the garlic, ginger, cumin seeds, paprika, dried chilli flakes and cayenne pepper. Cook stirring for 1 – 2 minutes until the garlic and ginger have softened and the spiced are fragrant. Drain the lentils. Add the drained lentils, canned tomatoes, stock cubes, sugar and water to the saucepan. Bring to the boil over high heat. Cover the saucepan and reduce heat to low. Simmer for 30-40 minutes, until vegetables are tender. Take off the heat and set aside to cool slightly. In batches, place the mixture into a food processor or blender. Blend until smooth. Transfer soup to a clean saucepan. Repeat with the remaining mixture. (Alternatively, you may wish to use a stick blender to blend the mixture in the cooking saucepan). Place the soup over low heat and stir until heated through. Season with salt and pepper to taste. Ladle the soup among serving bowls. Top with yoghurt, continental parsley and (if desired) a sprinkle of cayenne pepper to serve. Mmmm looks good!! Must try this one. Ingredient list looks rather long, but upon closer inspection, I’m pretty sure I have most ingredients on hand. Thrifty indeed! Lotte: Please do try making this soup. It honestly could not be easier. About 20 minutes of preperation and then it looks after itself. One other benefit is that it freezes well too. Enjoy! I have my own brooding architect who says exactly the same thing! I love lentil soup…good to see you’ve added a great whack of ginger! The Sophisticated Brisbanite: Good to hear I am not the only ‘architectural widow’ come summer time. If you are big ginger fans like us, I suggest adding even more ginger to make it extra spicy! The Drafty in Drag: I warn you that a ready supply of warming soups and thick coats will be in necessary to prepare you for the return down south after your time in the fantastic Sydney sun!